MSPB Releases Report Entitled "Prohibited Personnel Practices - A Study Retrospective"
What do the laws on sexual harassment, worker's compensation and the administration of leave and medical document requests have in common? Eleanor Laws. 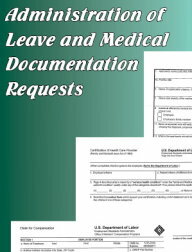 Administration of Leave and Medical Document Requests: Whether you are an agency attorney involved in disputes over medical-leave-related issues, an employee involved in administering employee leave, or a union representative assisting employees with leave-related problems, this book is an indispensable resource. The administration of leave and medical document requests can be confusing and tedious. This text provides, for the first time, a multi-disciplinary and in-depth discussion of an agency's responsibilities and potential liabilities when administering medical-related employee leave. Administration of leave is a comprehensive review of the laws and regulations governing this type of leave. 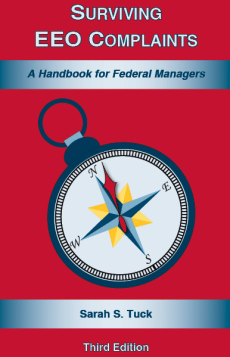 Federal Sector Sexual Harassment (by Hadley and Laws): Agency representatives, EEO managers, and supervisors will appreciate the guidance on structuring and maintaining an effective anti-harassment program. Complainants and their representatives will find this book an invaluable tool in litigating a sexual harassment case. Sexual Harassment details the basic elements of sexual harassment cases and the substantive issues presented in such claims. While the focus of this book is sexual harassment, the authors also discuss other bases of harassment such as race, religion and reprisal. Federal Sector Worker's Compensation: This book is a comprehensive analysis of the relevant statues, regulations, FECA Procedure Manual, and interpretive case law and will assist everyone from the novice to the experienced practitioner. The author devotes one full chapter to each of the following topics: the nature and type of medical evidence required to establish each element of a claim; the Energy Employees Occupational Illness Compensation Program; and vocational rehabilitation. All aspects of a compensation claim are covered, from internal agency handling of a claim through the OWCP process, including hearings, requests for reconsideration, and the appeals process to the ECAB, and much more! In Gonzalez, the Board held that the mere existence of an agency investigation into potential misconduct, even of a criminal nature, cannot alone justify placing an employee on indefinite suspension. While the opinion is fairly lengthy, the Board takes the time to analyze the historical basis for and application of indefinite suspensions, making for an informative read. The agency, U.S. Immigration and Customs Enforcement, indefinitely suspended Gonzalez, a criminal investigator, pending the results of an agency investigation into allegations that Gonzalez committed an act of domestic violence. In its proposal and decision letters, the agency explicitly noted that the suspension was not predicated upon any criminal proceeding related to the alleged misconduct or that there was reasonable cause to believe that a crime had been committed. When the agency has reasonable cause to believe an employee has committed a crime for which a sentence of imprisonment could be imposed -- pending the outcome of the criminal proceeding or any subsequent agency action following the conclusion of the criminal process. When the agency has legitimate concerns that an employee's medical condition makes his continued presence in the workplace dangerous or inappropriate -- pending a determination that the employee is fit for duty. When an employee's access to classified information has been suspended and the employee must have such access to perform his job -- pending a final determination on the employee's access to classified information. In the instant appeal, however, none of the foregoing special considerations are present. Instead, the agency has indefinitely suspended the appellant while it investigates whether it has strong enough grounds to take an adverse action against him for off-duty conduct. The underlying issues are within the Board's typical review authority, and the timely completion of the investigation appears to be largely within the agency's control. We note that the agency deciding official mentioned in his decision letter that he believed that the allegations against the appellant were "sufficiently credible." The agency's belief regarding the credibility of the allegations against the appellant is immaterial to our analysis, given the agency's charge. Notwithstanding the deciding official's remark, the agency plainly did not charge the appellant with committing actionable misconduct during the alleged incident on September 7, 2008. Further, the Reform Act generally protects federal employees from adverse actions based on mere suspicion or mere allegations of misconduct by mandating that adverse actions may only be taken for "cause," and by requiring an agency to prove the specific alleged "cause" by a preponderance of the evidence when an employee seeks review of the action by the Board. ...The agency has failed to identify any valid statutory or regulatory basis for the proposition that it can preliminarily suspend the appellant based on some lesser standard of proof while it gathers additional evidence to support an action based on the underlying alleged misconduct. For Dewey titles discussing Adverse Actions, see Adverse Actions by Corum, Uncivil Servant by Wiley, and MSPB Charges and Penalties by Fowler and Vitaro. Emphasizing that, although summary disposition of EEO affirmative defenses is permissible, MSPB judge's must exercise that authority with care. On appeal from her removal, Davis alleged that the agency's action was discriminatory and in retaliation for her EEO activity. The AJ struck appellant's affirmative defenses of discrimination by simply noting that Davis "failed to allege facts, which, if proven, would establish a prima facie case of either claim." The Board found the AJ's handling of Davis' affirmative defenses to be in error. First, the AJ erred by requiring that Davis provide comparator evidence to establish a prima facie case of disparate treatment discrimination. Second, noting that an AJ must make findings of fact and conclusions of law on all material issues of fact and law presented in an appeal, "the administrative judge also erred because he did not perform the requisite substantive analysis necessary to dispose of a discrimination claim without a hearing." Finally, the AJ's dismissal of Davis' affirmative defenses was premature. The Board remanded, ordering the AJ to provide Davis with proper instructions on how to avoid dismissal of her discrimination claims and to allow Davis an opportunity to provide evidence and argument on her discrimination claims. For titles discussing MSPB AJ's responsibilities, parties' burden of proof, and trial techniques, see Effective Summary Judgment Motions by Hadley and Tuck, Guide to MSPB Law and Practice by Broida, and Guide to EEO Law and Practice by Hadley. The EEOC recently released its Annual Report on the Federal Work Force Fiscal Year 2009, which assesses the state of EEO efforts throughout the federal government. The report includes the makeup of the federal workforce for the period from October 1, 2008, through September 30, 2009, and provides information relating to federal sector complaints of discrimination and suggestions for agencies to improve their performance. A total of 10,199 investigations were completed government-wide in an average of 185 days in FY 2009. Significantly, 7,432, or 72.9%, of the investigations were timely completed, less than FY 2008s 74.0% timely completed rate. Without the United States Postal Service's (USPS) investigations, the government-wide average drops to 61.8%, an increase from the 58.7% timely completed in FY 2008. The average General Schedule grade for women remained at 9.3 ($43,679 per annum), more than one grade below the average grade level for men of 10.4 ($49,604 per annum). From FY 2000 to FY 2009, the Total Work Force increased by 368,634 employees, a net change of 15.1%. However, the number of federal employees with targeted disabilities decreased from 27,231 in FY 2000 to 24,663 in FY 2009, a net change of -9.43%, resulting in a 0.88% participation rate. Only eleven agencies have achieved the federal goal of at least a 2% participation rate for Individuals with Targeted Disabilities.... Nine agencies with fewer than 500 employees exceeded the 2% federal goal. To review the full annual report click here. For more discussion on EEO topics, see Federal Sector EEO Update by Vitaro, Goodfriend and Gilbert, Guide to EEO Law and Practice by Hadley, and Surviving EEO Complaints by Tuck. On July 14, 2010, the House of Representatives passed the "Telework Improvements Act of 2010." While the federal government is no stranger to telework programs, this piece of legislation seeks to build on the government's current telework capabilities. By press release, the House noted that "during the record-breaking snowstorm earlier this year, the Office of Personnel Management (OPM) estimated that the federal government saved approximately $30 million in productivity each day the government was closed because of the number of employees who were teleworking." It is expected that the bill will increase competitiveness with the private sector, save money, reduce energy consumption and traffic congestion, bolster the productivity of the federal workforce, and improve emergency preparedness. Under the bill, each federal agency would be required to establish a policy authorizing employees to telework. The bills will now move to the Senate for consideration. To review the full text of the bill click here. In News and Case Alert #2-6, Dewey reported AFGE 3911 v. EPA Region 2, 64 FLRA 905 (June 23, 2010), dealing with back pay awards. The correct cite is NATCA and Dept. of Transp., FAA, Fort Worth, Texas, 64 FLRA 906.